When five year old Asawka Ahmed started showing signs of acute watery diarrhea (AWD) and vomiting, her mother, Nuri Bullo, was terrified – and rightfully so. The child’s cousin had died of a similar illness just days earlier. She quickly mixed a sachet of oral rehydration solution (ORS) with one litre of water treated with a chlorine tablet just as the health education teams had shown her during a community visit. Nuri kept urging her daughter to drink the solution, almost forcing it down her throat in her panic. 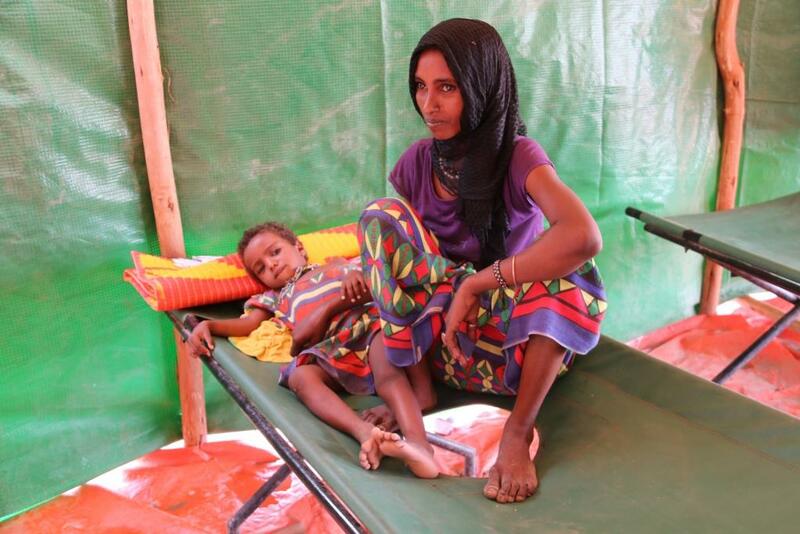 The rehydration seemed to help Asawka but the diarrhea and vomiting wouldn’t stop, so Nuri ran to the community head and pleaded with him to call an ambulance to take her child to the AWD treatment unit some 20km away at Ferede Health Centre. Once at the health centre, Asawka received ORS and intravenous fluid to replace the body fluid she had lost in the severe diarrhea. She was also given antibiotics to treat the AWD. After five days of treatment and observation in the tent designated for severe AWD cases, the child was ready to be transferred to the tent where moderate cases are being treated and could possibly go home soon. The WHO Health Emergency team in Afar, Ethiopia, works with the Afar Regional Health Bureau and partners to educate communities on safe water and sanitation practices including household water treatment, on how to protect themselves from acute watery diarrhea and what to do as soon as family members manifest signs of the disease. The team also supports AWD treatment centres in case management and infection prevention and control (IPC).